Today I was doing research for a Cub Scout Summer Activity Program and I hiked to the highest point in Orange County. 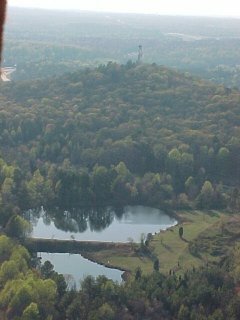 Occoneechee Mountain is 867 feet high and there are about 2 miles of trails in this state park. Fishing is permitted in the two ponds at the base of the mountain. This photo comes from this site. Previous Previous post: Remember Pop-up Books?